Sift flour into large bowl. Use fingertips to rub butter into flour until it resembles fine breadcrumbs. Add milk and mix until mixture begins to hold together. Turn on to lightly floured surface, knead gently 1-2 minutes until smooth. 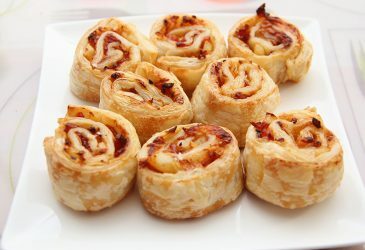 Roll out to 20 x 40cm rectangle and spread with tomato sauce, then sprinkle with ham and cheese. Roll up along long edge. Cut the log into 12 slices. Place on tray and bake 20-25 minutes until golden brown. Cool on a wire rack. Great to freeze too.